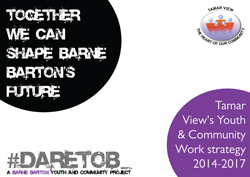 As the main providers of youth work in Barne Barton, Plymouth, we aim to take a young person led approach to our practice, facilitating the empowerment of young people to make positive change in the community. We work with children and young people aged 5 to 25 on a range of projects as outlined below. Our work is built upon the foundations of a consultation designed, delivered and evaluated by young people from the community. These Community Ambassadors play a key part in the formation of provision and will form a youth forum that will enable young people to continue to be heard. • Be creative - we explore new ideas and approaches, looking for what will add real value. • Be collaborative - we will work with our partners to achieve the best results. • Be inclusive - we value diversity and will work to make sure that the opportunities we provide are open to all. • Use evidence - we base what we say and do on research with the community and our own experiences working in Barne Barton. • Work with integrity - we are open and honest and do what we believe is best for our community. If you wish to know more about our youth work, please contact lead youth worker Jeff Dawson on 01752 294133 or 07547 897642 or email jeff@tamarview.co.uk. Alternatively, please visit http://www.tamarviewyouthwork.co.uk for full details. We have worked with partner agencies and young people to develop a youth work strategy for the next three years. This document provides us with a clear vision of what we want to achieve over this time period, outlining our target outcomes and strategy to achieve that vision. Please feel free to download a copy to understand our hopes. If you'd like to make contact regarding partnership opportunities, please contact Jeff Dawson on 07547 897642 or jeff@tamarview.co.uk.